I've been doing a lot of these Kickstarter posts lately. You'll be happy to note that this one I'm sharing due exclusively to personal genuine interest. 7th Sea is one of the two games that ran using the Roll and Keep system from AEG - the other game being L5R. I've never had a chance to play in a 7th Sea game, but I always loved the world and the system. There's just something about high seas swashbuckling adventures, mixed with an intricate political and fastastical background that really captivates. Also, I want to be a pirate, so y'know, there's that. Recently AEG began to move their RPG properties away from them. They sold L5R to FFG. 7th Sea, however, went back to its original creator: John Wick. Now, Mr. Wick along with some help from AEG and Magpie Games is bring 7th Sea second edition to life. And they're doing it in part with Kickstarter. The project is already off to a great start. They fully funded their goal of $30,000 within seven minutes of launching the kickstarter. SEVEN. MINUTES. They literally didn't have time to announce the kickstarter was up to the mailing list before it was funded. Since then, in the 3.25 hours that have gone since they've already breached the $150k mark securing several tiers of add ons and additional rewards. 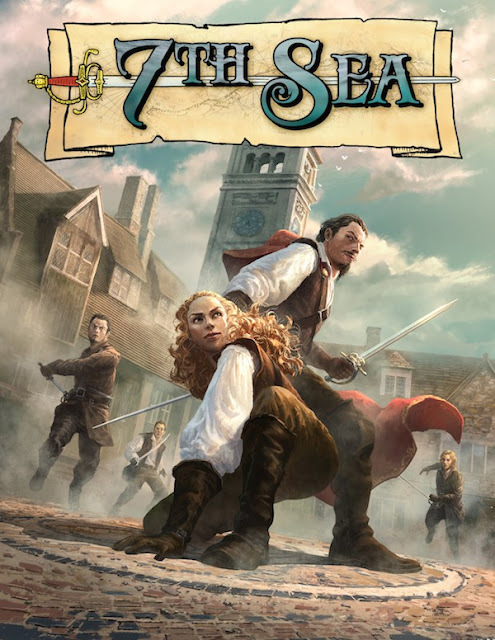 Oh, and as a fun bonus, several of the reward tiers includes PDF versions of every 7th Sea 1st Edition book released. It's about a $350 value that you get in addition to the stuff you're kickstarting. Not a bad deal if you like PDF books. Trying to really limit my game purchases but, like you, am a fan of Roll & Keep and L5R, so it's tempting!